Without doubt, Taylor Point at the northern end of Trinity Beach, 21 klms north of Cairns, is the last remaining and probably of the most substantial coastal lots of undeveloped land left on Cairns' northern beaches. For 25 years, the 18 hectare prominent headland has been at the centre of fierce political, legal and community debate. This Wednesday, it's fate may still not be sealed as it returns to Cairns Regional Council for development approval. The latest confrontation comes amid accusations that local Councillor Sno Bonneau has deliberately cut out the community, as the development approached Council for final approval. Last weekend, Cairns Regional Council CEO Lyn Russell explored Taylor Point. She must have been contemplating the impact this development will have, if it proceeds. The plan to build on Taylor Point, a stunning coastal headland gifted to the Anglican church in 1969 by Josephine Blessas, has a long a bumpy history. Blessas stated in a deed of gift that the land be "for youth work." Following much legal battles, the Anglican Church sold the 18 hectares to Rob Prettejohn in 1996 for around $3.2 million. However in that last few months, what can only be described as a series sinister events have occurred in the lead up to this week's Council meeting to decide the fate of this land. The Department of Environment and Resource Management granted approval on 9th February 2010, and since then, has remained a secret within Council. Just by chance, Save Our Slopes campaigner and local architect, Mark Buttrose learnt the day before it was due to go to Council on 23rd June. 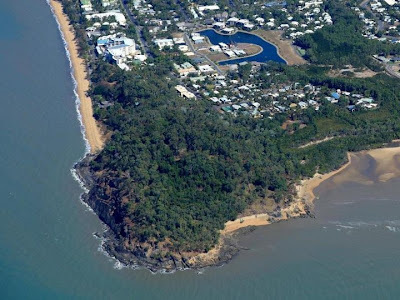 Buttrose says that proposed designations are in conflict with the Wet Tropical Coast Regional Coastal Management Plan which states the headland of Taylor Point shall be maintained as a natural feature, an iconic feature, visible from all directions. To understand the sensitiveness of this application, an interesting intervention happened at the recent Council meeting. On 12th May a substantial amendment to the CairnsPlan was deferred that was reviewing all our hillslopes, that also included Taylor Point. The deferral was supported by Cr Bonneau. The timing of this deferral is questionable, and suspicious. If such an overriding amendment to the CairnsPlan was to be put on hold, then any other development application that would be affected by the outcome of this, should also be deferred, pending agreement on the overall Hillslopes Plan. That the report be deferred pending a further workshop. 1. That the subject site be included in the Conservation Planning area with the area not affected by steep slopes included in the Tourist and Residential Planning Area. 2. That the Hillslopes Overlay be amended to include the subject site in the Hillslopes Category 2 Planning Area where included in the Conservation Planning Area and within the Category 1 Planning Area where included in the Tourist and Residential Planning Area. 3. The Special Facilities Overlay be amended to remove the Special Facilities designation No. 6 from Lot 10 RP724040. 4. Section 3.6.2 Schedule of Special Facilities Approvals be amended to remove the Special Facilities designation No. 6 from Lot 10 RP724040. ...the visual impact mitigation strategies proposed for Taylor Point have been tried extensively and do not reliably provide low levels of visual impact. Whilst some Cairns homes did achieve very low levels of visual impact, they would account for less that 10% of hillslope dwellings. The majority of hillslope dwellings have high visual impacts. This applies to many of the houses that observe the hillslopes building code as well at those that do not. There is little visual evidence that levels of compliance with the code are increasing and little evidence for the claim that the majority of houses which have high visual impact predate the hillslope building code. Casual observation suggests levels of visual impact are actually increasing as houses become larger and lots become smaller. Based on this assessment we conclude that the proposed development at Taylor Point will have high levels of visual impact over a broad area. The level of visual impact is likely to be as high or possibly even higher than any low density hillslope development seen in Cairns to date. Then on 23rd June, with no notification to locals, the Taylor Point application appeared on Council agenda for approval. This was nearly six months after DERM had advised Council, yet local Councilor Sno Bonneau did not advise his local constituents about the matter. He was well aware of its contentious nature and the strong feelings and history within the community. Council planners recommended approval of development, however it was deferred for two weeks, following intervention by Save our Slopes campaigner Mark Buttrose. The Combined Beaches Community Association have also been critical over the exclusion of local objections. They say that in accordance with the the Sustainable Planning Act 2009, an Impact Assessable Development Application must be accompanied by all concurrence and advice agency reports and conditions. "By Cairns Regional Council’s own admission they received a conditional report from DERM date 09 February 2010 that should by law have been attached to the application documents, thus allowing residents to prepare true and proper submissions six years prior," CBCA says. "As the matter stands and the time elapsed six years, it is evident residents lawful rights have not been maintained by Council during this process." "It will be recommended that Council send this application back to the IDAS Notification Stage. This will ensure residents lawful rights are protected and ratepayers will not have to incur the cost of legal action should Application be filed with the courts in this matter to see this occurs." Taylor Point land owner Rob Prettejohn, who also owns Thala Beach resort near Port Douglas, has hit back today and is furious about what he calls a "media circus." He calls the public debate a complete "falsehood." Prettejohn refers to a photographic depiction, prepared as part of the 2005 submission against the development. "I welcome genuine and constructive criticism however I have no respect for individuals or organisations that use untruths to achieve their aims." Rob Prettejohn wrote in a letter to all councillors today. "This has been a blatant and cynical campaign to manipulate public opinion. Truth and reason have been the casualties." Prettejohn says the plans that Save Our Slopes have used to promote in the media are not his. "There is a history of deception behind these plans. Dr Leslie Clarke, when she was [State MP for] Barron River, contacted me to advise that she was holding a media briefing on Taylor Point in Brisbane as a result of ‘state of the art plans’ which had been given to her by Mark Buttrose on behalf of SOS," he says. "I pointed out to her on the 9th February 2005 that these plans were obvious forgeries. The information had been deliberately falsified in both scale and content. She contacted Mark Buttrose. On being advised of the deception, he was not prepared to stand by the plans he had submitted ‘as it would damage his professional reputation’. As a result the media briefing in Brisbane was wisely cancelled." Prettejohn says it's very alarming to hear Mark Buttrose speaking this week with the same (or very similar) plan, "in full knowledge that it has been totally discredited more than five years ago." "This shameful conduct is nothing more than a dishonest smear campaign, designed to denigrate myself and my project," Rob Prettejohn said today. "The brief prepared by Council Officers for the last meeting of Council on 23rd June 2010 reflects the accumulated evidence of six years of careful and thoughtful planning: Countless meetings, open discussions, genuine concessions and agreements for improvement. I am confident you can rely on the evidence and concepts it contains." "At this Wednesday’s meeting I ask nothing more than you base your vote on the rational evidence put before you. Truth and reason do not necessarily come from the mouths of those that shout the loudest, but in the end truth and reason will prevail." However those fighting this development proceeding say that Taylor Point is the last undeveloped headland along the Cairns coast and the importance of preserving its natural condition was recognised in the Wet Tropical Coast Region Coastal Management Plan. The headland, its forest and beaches have long been used by the public for recreation, for over 25 years Northern Beach residents have fought to keep the iconic 18 hectare Taylor Point free of inappropriate development. While developer Robert Prettejohn has reduced the original development proposal from 39 to 31 residential lots, local residents fear that even this level of development will spoil the existing visual amenity of the forested, rugged headland and result in habitat loss. Moreover, while the current proposal is less dense than previously rejected proposals, the infrastructure to service the lots strung across the point, would require major vegetation clearing and construction on excessively steep hill slopes that is contrary to local and state planning policies. There's no doubt that local input and vetting has been curtailed significantly to sneak this development before Council. That alone should raise serious concerns for those that are asked to make such a significant decision. In a final and compelling revelation, CairnsBlog has obtained information from the Queensland Government today, that shows pretty much every square inch of the proposed development area, is either "Terrestrial Area of High Ecological Significance," "Conservation Corridor," "Wetlands of General Ecological Significance." This also extends beyond the area reserved for wetland in recommended conditions of approval. I don't believe the Town Planner’s recommendation addressed this. Prettejohn submits application for ROL (1 into 39) and MCU (from multi-dwelling units to single-dwelling residences) covering entire 18.818 ha. Referral for concurrence agency recommendation issued. Thanks for this article. Have heard about this issue. Looking forward to hearing much more, and what people can do to stop this proposed and ill-advised development. wow significant stuff Mike.... but I prefer the Cairns Post story,... smaller and you don't have to think! by putting such detailed information out there, you might get a job from the compost....or maybe not! I think that the critics need to take a deep breath and just consider how lucky we are that this site was purchased by a local person with a clearly demonstrated commitment to sensitive development, rather than an out of town quick buck character. The fact is that some form of development will take place on the site and who better to do it than a caring person like Rob Prettejohn? Do the critics really want Rob to decide that it is too hard and put it back on the market? Bonneau. aka...THE PHANTOM...likes the money and the prestige, but doesn't like to be involved with his residents, especially with something controversial or a little hard. And he doesn't even bother to attend all Council meetings. Goes off on holidays. Ho hum, he has a long history of this, but still keeps on being elected. Once again, the poor and powerless are the victims. Mrs Blessas bequeathed the land for facilities for under-privileged children. It was downright outrageous of the Anglican Church to deny an old lady her dying wishes. An Alternative motion to Not approve this very controversial development was finally upheld by the majority of Councillors (with only two voting against Bonneau and Cochrane I think). Councillor Bonneau spent much time waffling on about all the special covenants that Officer's had recommeded for this site in their support of this development. One only needs to take a walk up the back of Paradise Palms (behind the Club house) to see first hand how the strict covenants placed on that once Conservation Area have been adhered to (NOT). The lot owners have been allowed to build monstrous two storey concrete homes covering just about 90% of the blocks. What vegetation, what wildlife, what covenants? It is truly a joke. Julia pointed out in the meeting that there is only one Council Compliance officer to manage an area from the Daintree to Mirriwinni so if this is true and with the evidence all around us, then everyone should be in no doubt that these covenants are not worth the paper they are written on!!! All you mortal coils should go and address your conscience as you have got it oh so wrong. Why should Robert Prettejohn not be allowed to develop his land? It is not fair for him to bear the responsibility of the Anglican Church's cardinal sin. He did after all buy it on the open market legitimately!! Yes John prettejohn did buy taylor's point but he forgot to study the planning code and previous court decisions. If I buy the block next to you why can't I put up a 100 storey building - it's called planning. Actually, I would like to support the current developer! This has been a controversial site for years yes!? The reality is that the vision of the original donor has been surpassed admirable as it is! I have not seen any plans but if Thala is any guide i would welcome it at that site!? The disgrace is what happened down the road on the Hedley developments of the old TB pub!? I am curious on the comments here on Mark Buttrose which are actually the most astounding and if it's fair enough in need of explanation? They seem to imply dishonesty? Is that the same person responsible for that appalling city place toad stool by any chance? I totally agree with CA. If Taylor Point is to be developed as it is sure to be at some stage in years to come let it be done now by someone who will do it tastefully with consideration of the environment. If Kewarra Beach Resort and Thala Beach Lodge are examples of Robert Prettijohn's earlier work other developers cold learn a lot from him. Robert Prettejohn's plans to carve-out a few dozen house blocks on Taylor Point is environmetal vandalism. because of any effective local protest. units on to the site. So the Church breached Mrs.
"God's work" in the Cairns Diocese. than sub-divide it in to 30 something house blocks. proposal struck me as acceptable. The "result" in these situations is preordained. The court gets a negotiated settlement which will remove a couple house blocks and realign a couple roads. Councillors can all claim they "voted the right way" and those of us rich enough to buy one of these blocks will have an enclave where we don't have to be around most of you hillbillies. The fact is us rich people need a place to live, too. We deserve to have nice seaview land as I know many who are sick of Edge Hill being overrun with losers. The Prettijohn family know what the upscale Cairns resident wants. Yairs, Ed in EdgeHill, we know what you mean alright, no confusion anymore thanks to the Bluewater silvertails who spelled it out for everyone. No blacks, no pensioners, no invalids, no unemployed, and no (ugh) low wage earners. In other words, only those whose motions don't stink and who have no conscience about living on land bequeathed to poor children. I take the points above about Rob Prettejohn being a 'senisitve' developer, but if you look at the current plans which were rejected by Council last week, ALL of the land comprising the hill, to high tide mark, were incorporated. There was no public space for kids or anything. Even the part of the beach leading up the hill would have been part of someone's block, or roads. Additionally, to install the infrastructure for 30 houses, a lot of bush would by necessity, be lost. Because it has been undeveloped, Taylor Point is a lovely spot to go and fish, or walk your dog (low tide you can get right around to Kewarra Beach), or just hang out. There are amazing tracks over the hill (billy-goat style, but great), & a few incredible significant trees throughout the property. There is also a lot of wildlife there - you can hear wallabies thudding through the undergrowth, & amazing bird calls. (I lived just around the corner off Moore St a couple of years ago, & used to go to the Point most nights). However, the problem now is: if Prettejohn is going to be prevented from developing it, then what happens. The man has bought the land, freehold, in good faith. If we are to retain it for the community, then how?, either the State Govt or Council would have to cough up the money to buy it. Since neither Wettenhall or Turnour put their hands up to do a thing in Cairns, well, that's probably out. Or, does Prettejohn scale the thing down to 10 or 15 house blocks, leave a lot more open land, & negotiate ceding land behind the beach, & to allow walking tracks? I personally would love to see the whole area left wild - there are so many built-up places in CAirns these days, it's lovely just to have some space where you can hear the leaves rustle on the gums, and clear birdcalls. But something will have to happen one way or another. By the way campers, these issues go to the Planning and Environment Court, where there are no costs awarded to either party, unless an issue which has been brought to court is vexatious (ie. a nuisance-case). So all this Bonneau-speak about it costing us 1 million to take it to court, & causing a rate rise, is a nonsense - & he knows that. I have known Robert Prettejohn for many years and know fondly of his love for the environment. I have been lucky enough to join him on some of his many bush walks around the Far North Region and have learnt that he is a man who has a genuine interest in ecology and have myself learnt so much from him during these walks. Knowing the character of Robert Prettejohn and from visiting many times his previous projects, I have complete faith in Robert Prettejohn to develop Taylor Point with the sensitivity required for a property of such rich natural beauty. I'd hate to think of what Taylor Point would have looked like if the Church had got approval for their plans back in the 1990's. Or what would have happened if the Church had of sold the land to a developer other than Robert Prettejohn. Realistically this block of land is fated to be developed at some point, what the community needs to question is just how this land will be developed; whether they wont to see another developer come along and build high rise unit complexes along the cliff tops and high water marks, or whether they want to see low level residential buildings built within environmental guidelines?!! Josephine Blessas left Taylor Point to the Church with all good intentions, these good intentions were short lived by the Church and it was the Church who took an old ladies good will and turned it into a profitable sin. Robbert Prettejohn has no responsibility to fulfil Josephine Blessas bequeathing wishes, and this should no longer be a relevant part of the Taylor Point debate. Blessas betrayal by the Church will however always be an interesting part of Taylor Point's history. When the fundamental rationale for NOT developing TP is because it happens to the very last such block in the region - according to the article above. Thus, has now attained a unique status, with special aesthetic, ecological and social value. In stark contrast where economic values have most evidently held precedence everywhere else. And Robert Prettejohn's ecological credentials - however laudable - doesn't change this basic fact.